He said he has to use the original brakes. What to do about Z brakes? "The stock Z brakes are adequate for street driving, autox, and drag racing. The stock Z brakes are adequate for street driving, autox, and drag racing. The stock Z brakes are adequate for street driving, autox, and drag racing." Experiment with pad and shoe materials. After experimenting with all of the popular brake pads such as Hawk, Porterfield etc. I prefer Carbotech AX6 material. Excellent cold bite that grabs hard the hotter the pads get. of course they are inadequate. Is this an assumption or is there something behind the statement? Serious question, I just hate to see people waste time, money and effort if they don't have to. If they have been shown to be "inadequate" the proper next step is to define in what way they are inadequate. Heat buildup, stopping power, wear rate.. etc. Even if a person decides to go ahead on just the assumption that they're inadequate, these things need to be defined. You can't improve something unless you know where you started. You could actually end up with worse brakes than when you started. And not even know it. Hey Miles, have you had any noise, chatter or squeal issues with those Carbotechs? I'm currently running the Porterfield R-4S and am reasonably happy with them, but always willing to try something new. Mostly auto-x and track use, but the R4's were driving me nuts when cold. I think all you can do is a more aggressive pad, up until you can’t keep them cool. Then focus on heat control. i don’t know about the longevity of the aluminum drums, but they must dissipate the heat quite a bit more then an aftermarket steel unit. The problem with Hawk and Porterfield "street pads" is that they lack cold bite for daily driving. Both brands were like blocks of wood when cold driving in stop and go traffic. Freeway driving was out of the question. I switched back to stock pads and shoes from my local Nissan dealership for several years. In 2009 I experimented with several of the popular brake swaps and ended up with Toyota solid front calipers, 79 280ZX MC, 280Z booster (nice) 240SX rear calipers with Axxis ULT pads all around. This set up worked fine for a daily driver and some mountain driving. But I kept looking for a better street pad. In 2017 I replaced the Axxis ULT pads with Carbotech AX6 pads. Very noticeable improvement. No more tweaking pad material. 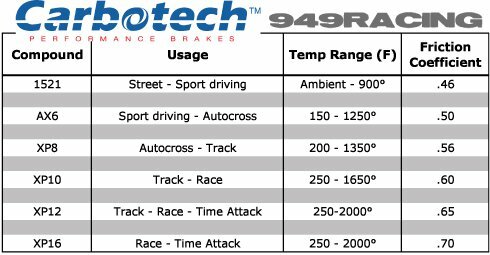 Have used the Carbotech XP10 compound on my race car and have recommended them. But yes, the racing class my friend runs in requires the use of standard OE brakes, he is improving the usual stuff like cooling and compounds but there are also more subtle possibilities like shims made of ? to reduce pad/bucket heat transfer, modifications to the OE parts, heat/freeze treated rotors, heat extracting wheels and so on. He has to use 14x6 period style wheels. It's all about attention to detail with his car class. XP20 Carbotech compound placed on the stock backing plates. Make sure to use that thin metal shim on the back of the pad since it acts as a heat shield. Better yet get some thin titanium and make shields from that. Cutting it will be interesting but doable. Speed kills - pads, shoes, rotors and drums. If you use race shoes remember they generate more heat and that can warp those aluminum drums. Add fans to the front brake duct to get more air circulating into the rotor and direct some at the caliper. I'm not judging, but get track data to verify just how often and how hard you are braking to compare with other drivers. You could get cross-drilled brake lines that are suppose to keep the brake fluid cool. You would need a large tank of fluid however. I wonder if synthetic fluid might be more heat resistant. You could plumb tubing from a spoiler to the rotor to blow cool air on them. Dang I can't find the link from a couple years ago. I think I saw something on Kameari's website about reproducing new castings of the mk63 calipers. They had pics of the rough castings pre machining. I had to translate the japanese obviously. I can't find it on their site now. It was awhile ago though maybe it wasn't Kameari. Parts Assist M Speed has the new units though. I know I wasn't on their site when I saw the post about the castings from a couple years back. These were a factory Z, hako, caliper for vented rotor. I'd run these. Not sure what the "stock" rules mean in his class but the mk63's were the road racing caliper back in the day weren't they? (I don't know too much about the old factory race car setups from back in the day) I've always assumed the mk63's were the homologation brake for one of the lower sports car classes. *I would ignore the rotor diameter callout in the RHD description. Also, found this on the "other forum" should be some info in here. Edited my above post to reflect some other stuff I found. You could always try a BBE coating on the calipers, and maybe the drums. I think it's a matter of running the right compound that still functions at high temps. Back in the day katman had a thread where he was talking about running 2 3" ducts to the front brakes to keep them cool. I looked for it and couldn't find it.